Apology flowers and gift baskets are classic gifts for saying sorry. They're always welcomed and appropriate for almost any situation—even in business. These types of classic gifts enhance both verbal and written apologies. The best part is that you don't need to worry about the flowers or baskets being delivered at the same time as your apology. Because when they are delivered after you apologize, they serve as a heartfelt reminder about how sorry you are and tell the recipient that you took the extra step AFTER apologizing to get them a symbolic gift. Finally, when it comes to intimate relationships, apology flowers are a better choice than gift baskets and ideal for a girlfriend, boyfriend, husband or wife. They also work well for friends. When choosing flowers to say I'm sorry, make a little extra effort in selecting the right ones. Historically, flowers have a great deal of symbolism in both variety and color and some flowers are more appropriate than others when saying I'm sorry. For example, any spring flower like tulips, irises and daffodils symbolize new beginnings and starting over. So they're ideal for letting the recipient know that you want to start over. If you know their favorite flower, definitely include it as an option. But before making any final decision consult the list of flowers below to find out why we consider them to be the best apology flowers. Traditionally Tulips and Hyacinths can symbolize forgiveness but the idea for us behind any Spring flower is new beginnings and starting fresh which can make a lot of sense depending on the infraction committed and what you're saying sorry for. In terms of color for saying sorry with this group of flowers, choose fresh tones, nothing too dark or rich in color—think Spring and new beginnings. The concept of new beginnings works very well for business—explain your choice of flowers and the reason behind it while apologizing and start anew with colleagues, partners or customers. With ancient Greek tradition, the lily is known for it's majestic beauty—especially the Calla Lily variety—which we love for its inherent graceful beauty. Generally though, humility and devotion are two traits associated with the flower. Any variety is appropriate however the Calla once again is ideal for an apology directed to a girlfriend or wife because of their inherent beauty. 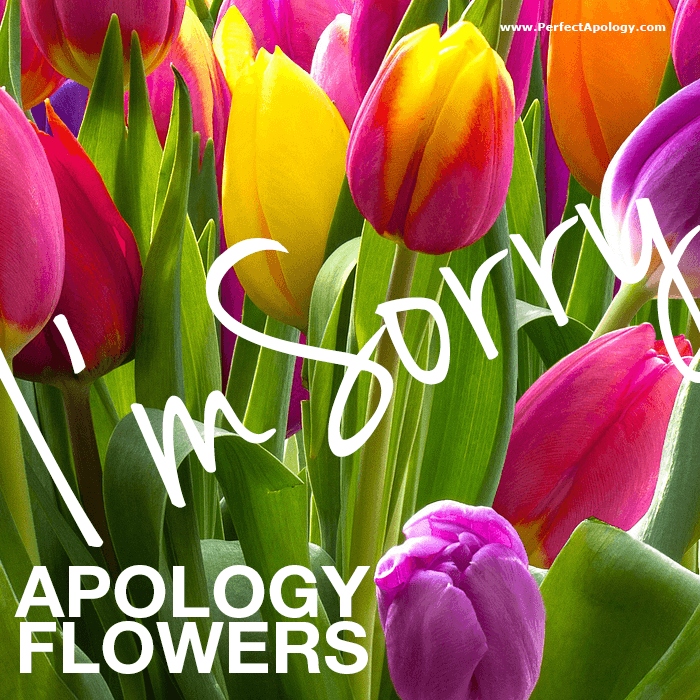 In terms of color for these apology flowers, choose whites and pastels or lighter tones. We especially like the Calla variety again because it's not a frilly flower and more architectural in design. For color, choose solids, white or darker tones. The darker colors and structured form make them ideal flowers for men too. Any variety and color is appropriate. The exotic nature of the flower along with how long orchids last, shows the recipient that you are taking the matter seriously and won't soon forget what you did. Because they symbolize strength and virility, they're one of the best apology flowers for men. They're ideal for business situations because of their architectural structure and exotic beauty is so highly coveted. In terms of color for business, choose solids, usually white or very dark tones—and a plant (preferably double stemmed) as opposed to a bouquet. The flower of love. Appropriate for any personal intimate situation, preferably long stemmed—this isn't the time NOT to appear to be making an extra effort. Red for true love (the ideal flower choice for a girlfriend or wife); white for innocence, virtue, purity, reverence and humility; yellow for friendship and apologies (if you're sending sorry flowers to a friend, the yellow rose is ideal); dark pink for gratitude; red and white together symbolizes unity. Roses are rarely appropriate for business situations unless a close friendship has developed and the parties are of opposite sexes. If you feel roses are appropriate then choose the color carefully. Traditionally Daisies are associated with classic beauty, loyal love (as in "he loves me, he loves me not...") and friendship. The Gerbera variety shown here is known for happiness and cheerfulness. If the infraction wasn't too serious and making someone feel better about things is your goal then Gerberas are the way to make them happy. Choose their favorite hues and create a rainbow of color. For apology flowers our go-to online retailer is Flora2000, they offer Local and Worldwide Delivery and have great gift baskets and exotic plants too. Some items are available for same day delivery and they even have specific categories for business gifting and saying sorry. We particularly like them because their bouquets and arrangements have more interesting styling and a European flair. Gift baskets are another traditional and thoughtful gift when apologizing. They're great for personal relationships and ideal for business situations because gift baskets last a while, can be shared among friends, family and colleagues, and can be tailored to the recipient(s). We love the folks at Design It Yourself Gift Baskets. We've always found the perfect gift and basket from these guys. They have a huge variety of different gourmet baskets targeted to different people, gifts for him, for her, corporate gifting, and a feature where you can design your own themed baskets—everything from chocolate lovers, to coffee fanatics, golf enthusiasts, spa gift baskets and more. For personal and corporate gifting, we also like TheFruitCompany.com They offer all types of fresh fruits and other goodies to complement them, like cheeses and nuts, and chocolates and dessert. They have the best selection of beautifully packaged fruit baskets, towers and boxes chock full of healthy options including organic, gluten-free and kosher. Apology gifts are all about saying sorry. Flowers and gift baskets may be an obvious or traditional choice for apologizing but that doesn't mean they aren't also a very thoughtful choice, especially when thought is given in their selection. Looking for something truly romantic? Then check out these romantic apology gift ideas.